Santiago is a busy, walkable city, with a fairly compact downtown. But there are times when you’ve had enough of having to move along at the speed of the crowd, and wish you could have a more spacious place to be. And you can. 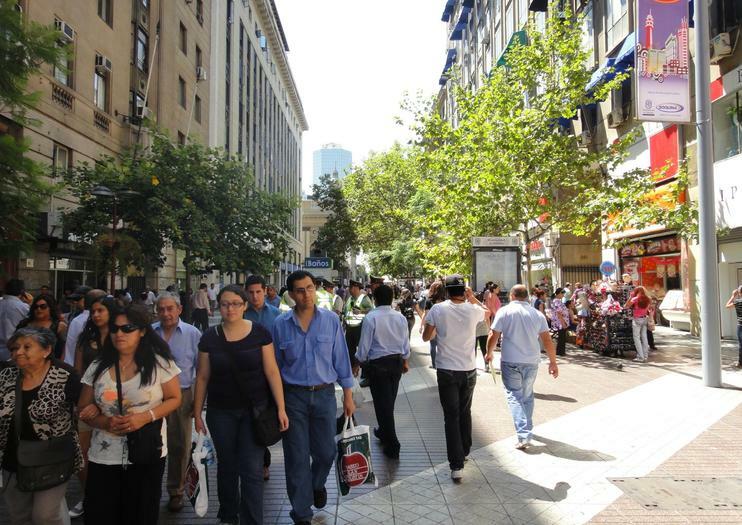 There are three major pedestrian thoroughfares in downtown Santiago, Huérfanos, which runs west down from Cerro Santa Lucía, and both Paseo Ahumada and Paseo Estado, which stretch north from the Alameda (Avenida Libertador Bernardo O’Higgins) towards the Mapocho River and Mercado Central. Paseo Ahumada is perhaps the busiest of the three, and you’ll find families and individuals walking, talking on the phone or sitting on benches at most times of day, On the street there are nearly always street performers and vendors, selling hats, scarves, and the occasional television antenna. There are also popular stands selling mote con huesillo, a local drink made of sweet peach punch with reconstituted dried peaches and wheat kernels at the bottom. Shoe stores and fast food, ice cream, cafés and some of the major department stores fill out the rest of the blocks, which quiet down after work or when it gets dark. Instead of walking into Paseo Ahumada directly from the Alameda, dip down about half a block further and start in on Nueva York, a quieter, cobblestoned street with historic fountains that runs past the stock exchange. And further along on Paseo Ahumada, plan a stop at the Cathedral, which is on Santiago’s Plaza de Armas. Enjoy a night out in Santiago on this 4-hour tour with private transportation. With a guide, see city sights such as Plaza de la Constitucion, and then enjoy dinner and a show. As you dine on Chilean cuisine, you'll be entertained by a traditional dance performance. When booking, you have the option to include drop-off at the end of the night or not.